Discover Verona, the beautiful city of Romeo and Juliet! 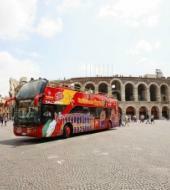 Explore the city of Verona in a comfortable way with the Hop on Hop off bus. We offer two different bus lines, each will bring you to the most famous sights of the city! From this area it's possible to reach Piazza Erbe and Piazza Signori (also known as Piazza Dante). Commentary available in: Italian, English, French, Spanish, Portugese, Russian, Japanese and German. A ticket is valid for 24 hours and the buses are weelchair friendly.